I know it’s spring when I step outside and a whiff of lilac’s heady fragrance hits me. Do you have those moments when a smell or a taste takes you back to a memory long long ago? For me, it is the lilac. Its fragrance takes me back to my childhood—my mother had a long row of lilacs and she filled vases full of them that perfumed our house every May. Another cherished memory is a day spent with my sister at a lilac festival in Oregon. We sniffed scores of lilac varietals all afternoon and were giddy from pollen. When CRR and I moved to a house with a large yard (half an acre, big for the suburbs), we planted a row of them along the west side of the property. A dozen years later, they’re six feet tall and will soon form a hedge. 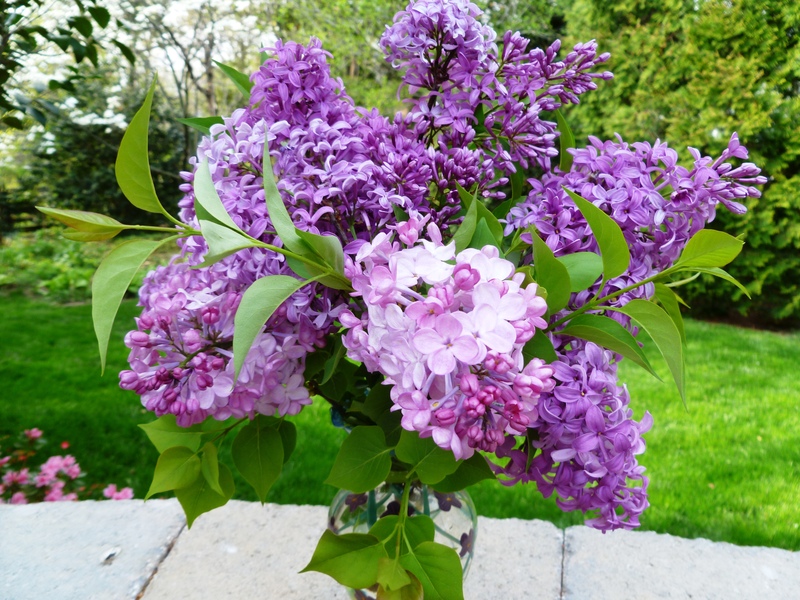 Our lilacs are the upright shrub variety, the common lilac called Syringa vulgaris. According to the Virginia Cooperative Extension, lilacs have graced gardens since the 16th century. There are 2,000 cultivars, in colors ranging from light pink to magenta and violet. They’re tolerant to the sun, drought and clay soil of my Alexandria yard. In a fickle growing environment, my lilacs are an old-fashioned stalwart. In a region where azaleas and cherry trees are much-heralded, it is the lilacs that spell spring to me. Sandy Johnson is a journalist who is equally passionate about gardening and politics. She lives in Alexandria, Va.
Ah yes, the lilacs of spring. After crocuses, they were the cherry blossoms of my town as well. A sure sign of rebirth, renewal and staying out in the backyard late into the night. May Day wouldn’t have been May Day without vases of lilacs placed on fine lace doilies. Nice blog post. We’ll be looking for many more.